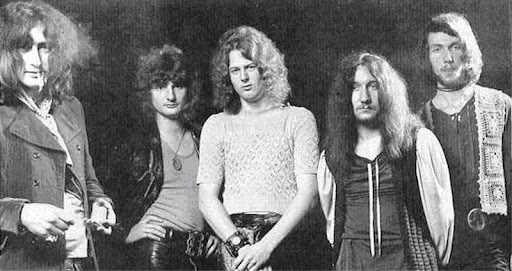 Ollie Olsson left Uriah Heep for Elton John and had been replaced by Keith Baker. Hensley writes half and co-writes the other half of Salisbury Album. The album's self title track is a master piece if 16 min. / 22 sec. with many coloured organ, guitar and bass riffs. Salisbury brings a proper musical identity. After Salisbury Keith Baker left the band, beeing replaced by Ian Clarke on Drums. Ollie Olsson p�r�seste Uriah Heep �ntorc�du-se la Elton John si este �nlocuit de Keith Baker. Hensley scrie jum�tate si compune parte din cealalt� jum�tate a albumului Salisbury. Piesa care d� numele discului este o capodoper� de 16 min. / 22 sec. cu multe nuante fine de Jazz, solo-uri prelungi de org�, chitar� si bas. Salisbury aduce astfel o identitate potrivit� formatiei. Dup� Salisbury Keith Baker p�r�seste trupa, fiind �nlocuit de Ian Clarke la tobe.